The New Canadian Monthly on New Theology and Psychic Research / Devoted to New Theology and Psychic Research. 1/1, September 1899-1902. 25 cents a year, 16 pp. 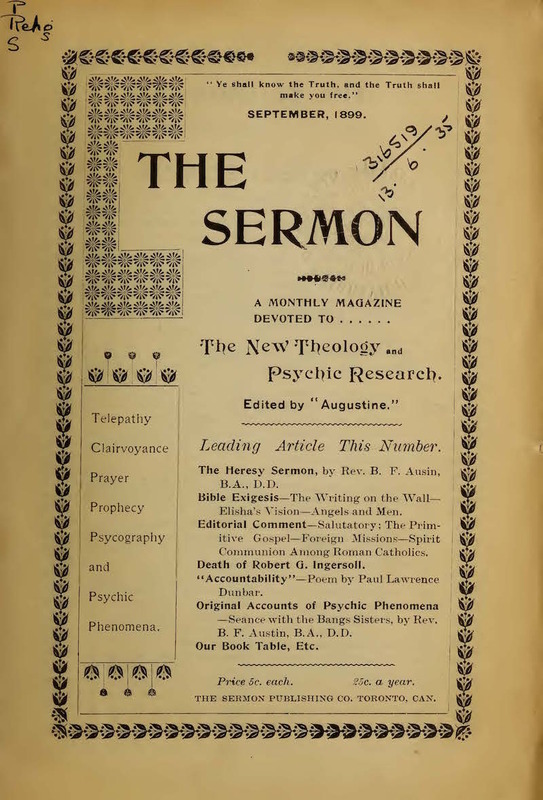 The Banner of Light, September 23, 1899, describes this as a "psychical monthly" and notes that Austin (1850-1932) had recently been tried for heresy and expelled by the Methodists. Austin later billed himself as "The Canadian Heretic." On Austin, See Ramsay Cook, The Regenerators: Social Criticism in Late Victorian English Canada (Toronto, 1985), 68-84. The first issue announced that the journal "guaranteed" a circulation of 1500 and had obtained 500 subscriptions before publication. NSAC, Lily Dale.